You may wish to read an introduction to this section or a page describing the location of Chioggia first. 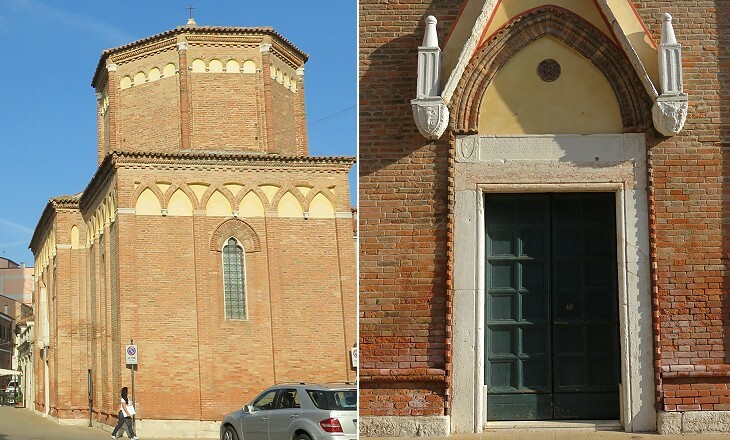 Chioggia became a bishopric see in the early XIIth century when the Bishop of Malamocco moved his residence there. Malamocco was an ancient harbour on the island of Lido which was abandoned because of the erosion of the coastline by the Adriatic Sea. 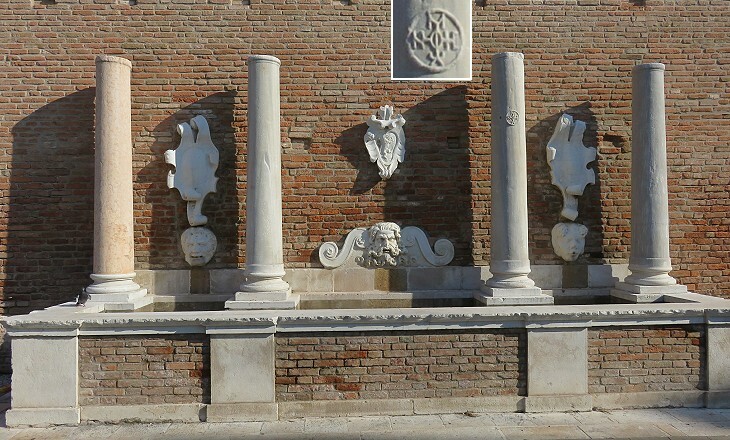 The oldest evidence of medieval Chioggia is a column with a monogram, which was previously inside the Town Hall. Monograms were widely used by emperors (e.g. Justinian), popes (e.g. John II), kings and bishops until the XIth/XIIth centuries when they began to be replaced by coats of arms. The Cathedral was rebuilt in the XVIIth century, but its bell tower is dated 1347 and it replaced a previous one that had suddenly collapsed. It is one of the few monuments of the period preceding the seizure of the town by the Genoese in August 1379, the major event of a war (1378-81) which is named after Chioggia. The war originated from a dispute over the possession of the small island of Tenedos in the Aegean Sea. The church and convent of S. Domenico were built in the XIIIth century on an islet at the north-eastern end of the town. They were rebuilt in the XVIIIth century, but the bell tower is the original one. In 1315 the Franciscans built a large convent on another islet at the opposite end of the town. In 1806 it was turned into a warehouse and later on in a garage. 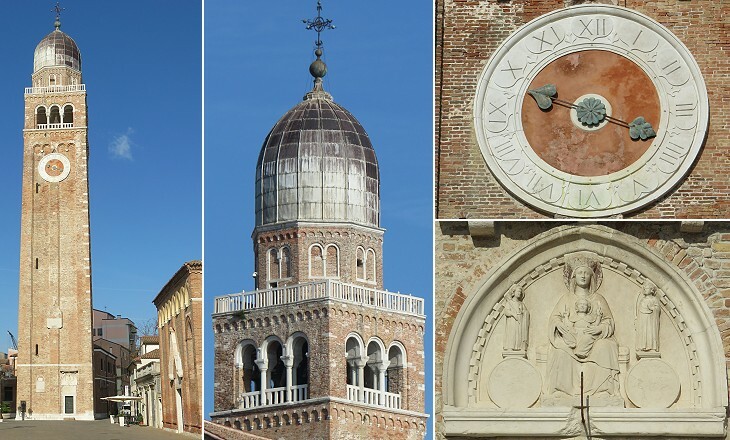 Today it houses a small historical museum of Chioggia and its territory. The Genoese seized Sottomarina before attacking Chioggia. The inhabitants of the small town, which had a church dedicated to St. Martin, took refuge in Chioggia. They were unable to return to their homes after the war and they therefore built a small church dedicated to St. Martin opposite the Cathedral. It is an elegant building with excellent brickwork which was completed in 1393 as stated in an inscription on its portal. Modern Sottomarina has a huge late XIXth century church dedicated to St. Martin. 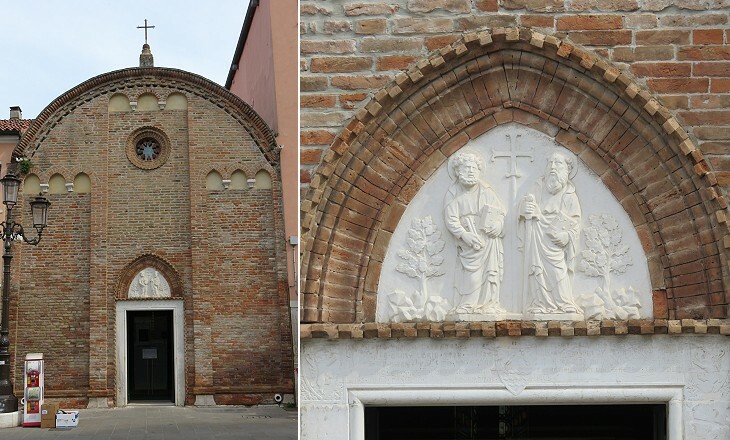 This small chapel is another example of the reconstruction of Chioggia after 1379. It was paid for by a donation made by Pietro Mazzagallo in 1380, but it was consecrated in 1431, because of difficulties in receiving the authorization to build. 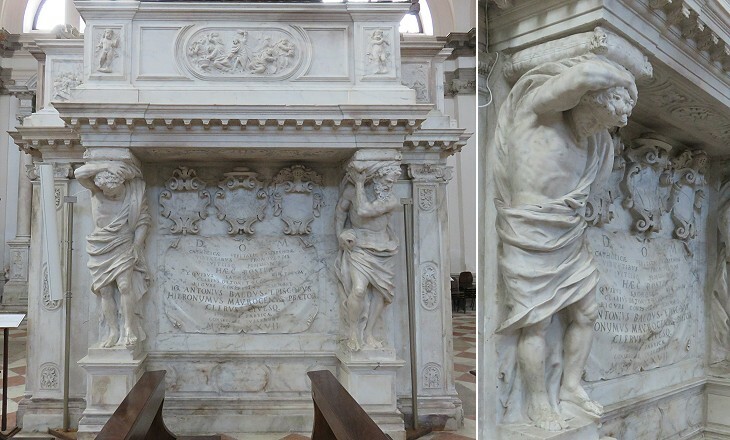 Musician Giuseppe Zarlino (1517-90) began his career in this oratory. Istitutioni Harmoniche, a treatise he wrote in 1558, is regarded as a major contribution to the science of music, in particular in matters such as counterpoint and musical tuning. 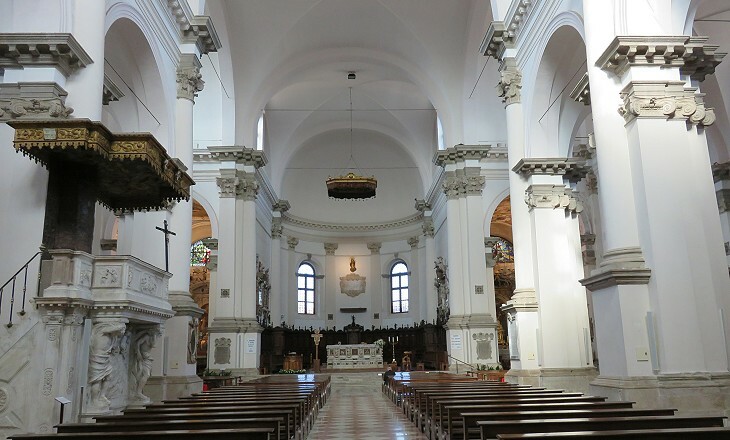 S. Pieretto was deconsecrated in 1797 and only very recently it returned to be used for religious purposes. 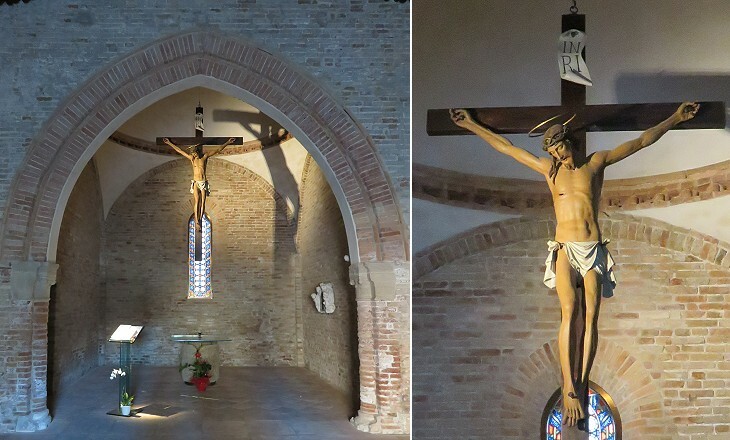 Its restored interior houses a Renaissance crucifix (it opens in another window) from another deconsecrated church of the diocese of Chioggia. 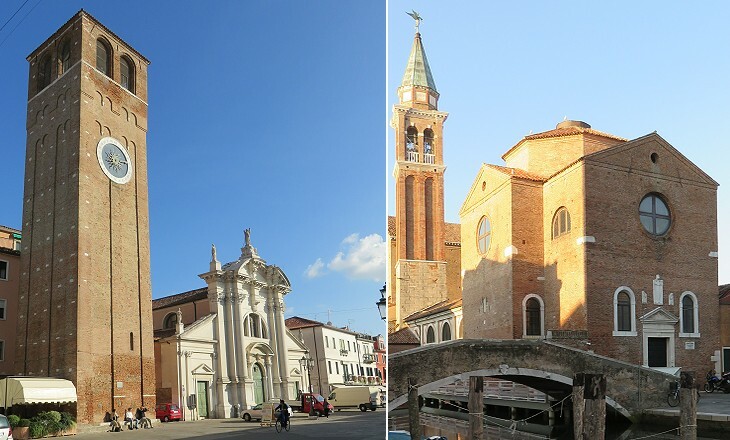 In 1623 the old Cathedral was damaged by fire and it was decided to replace it with a much larger building with a new entrance from Corso del Popolo, the main street of Chioggia. In 1814 a balustrade and a statue known as Refugium Peccatorum were relocated to a small garden to the south of the Cathedral. Refugium Peccatorum (Refuge for Sinners) is a title for the Virgin Mary and when the statue was in its original location near the Town Hall, convicts who went to the scaffold were allowed to stop in front of the statue to pray for their soul. 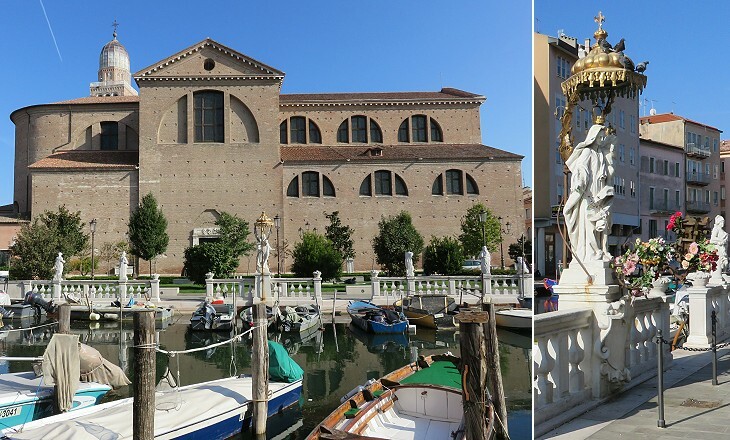 The new Cathedral was designed by Baldassarre Longhena, at the time a young architect without much experience. 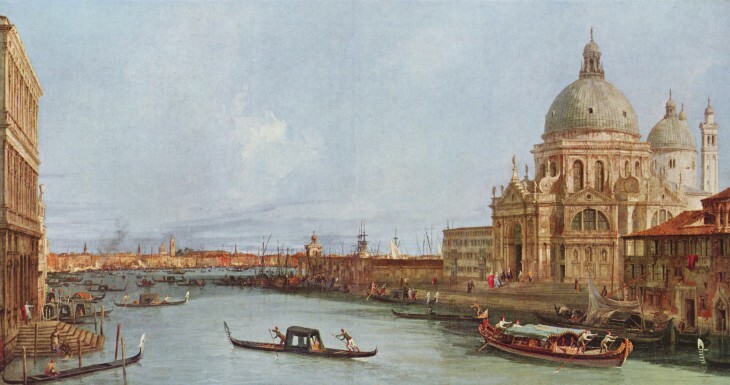 He was to become the best known XVIIth century Venetian architect by designing S. Maria della Salute (you may wish to see it in a painting by Canaletto - it opens in another window). You can see a detail of the decoration of the interior in the introductory page of this section. 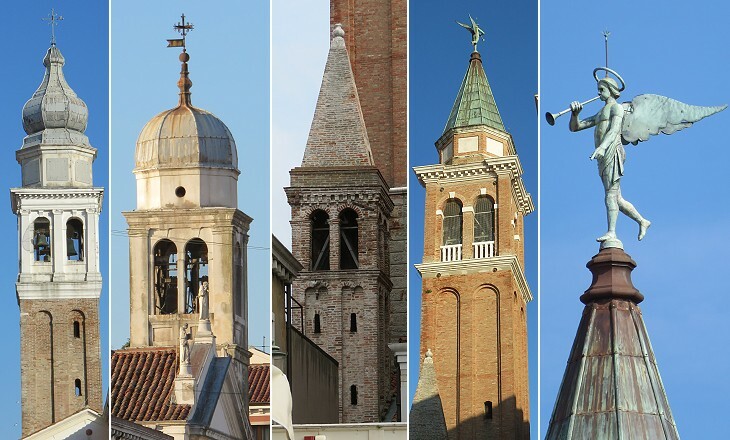 It shows how Longhena developed new ways to arrange capitals, a traditional architectural element. Longhena took care of the decoration of the interior until his death in 1682 and both the pulpit and the main altar were built in line with his recommendations. The pulpit is a work by Bartolomeo Cavalieri and Domenico Negri which was completed in 1677. It is interesting to observe the two telamons (or atlases) holding the balcony of the pulpit. They were frequently used to decorate portals in northern Italy and eventually in Vienna, but not in Rome. The contrary applies to the celebratory inscription on a fake cloth which was made popular by Gian Lorenzo Bernini in the Monument to Maria Raggi in S. Maria della Minerva in Rome. The decoration of the Cathedral is marked by the use of two colours only: white and grey. 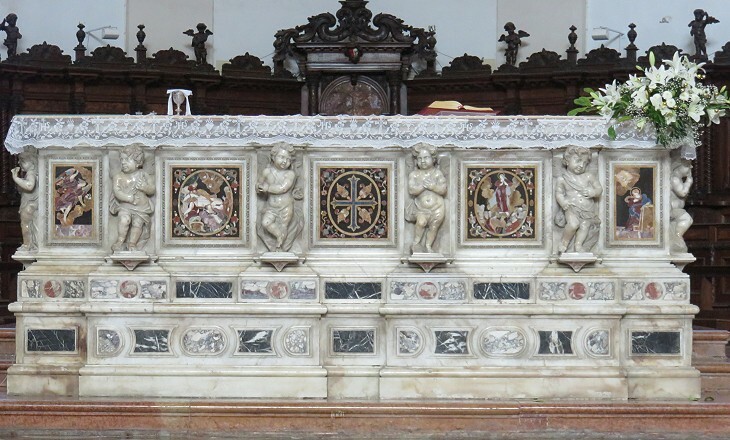 In the altar however, perhaps following the prevailing fashion in Rome, marble inlays and coloured stones were employed. 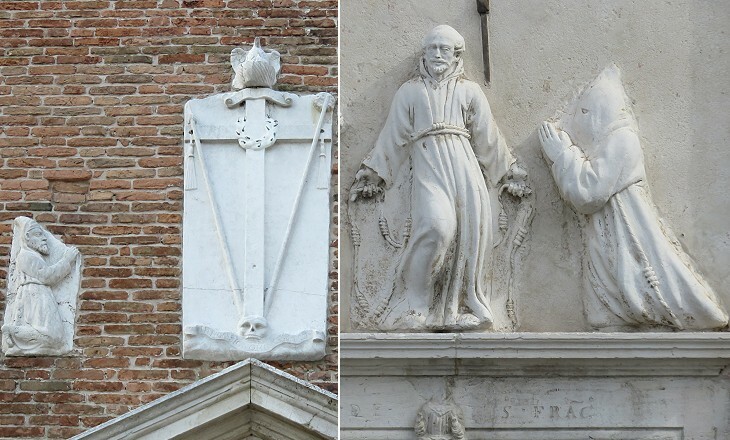 It is attributed to Alessandro Tremignon who later on designed the gate of the Arsenal of Venice. The decoration of the Cathedral took a long time and the two chapels at the sides of the main altar have paintings and stuccoes of the early (SS. Felice e Fortunato) and late (SS. Sacramento) XVIIIth century. They do not match the overall neat design of the interior by Longhena. The church was rebuilt in 1742. The exterior is very unassuming, but in the interior architect Pietro Pelli followed the patterns developed by Longhena. 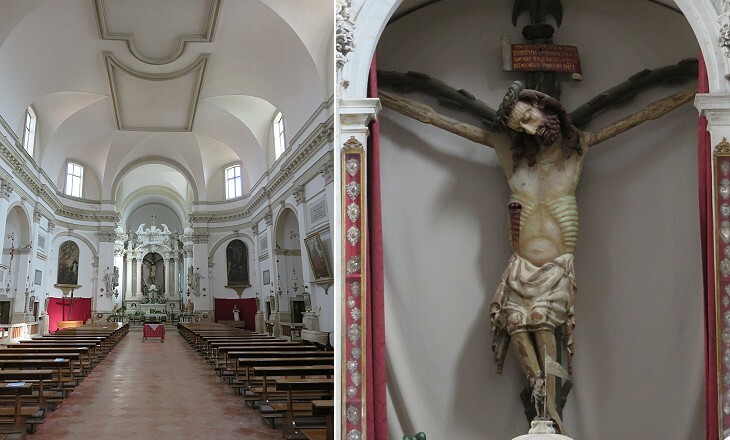 The church retains most of the works of art that decorated the old building, including a wooden Crucifix to which the fishermen of Chioggia were particularly devoted. There are many accounts about how it ended at S. Domenico, including one which says it came from Constantinople during the XVth century. Art historians however think it was most likely made in the Rhine valley in the XIVth century. St. Paul by Carpaccio is signed and dated 1520, so it is one of his last works. It is a rather academic portrait, whereas the painting by Tintoretto is full of movement and shows knowledge of perspective laws. The image used as background for this page shows the head of St. Catherine of the Wheel in the lower part of the painting. 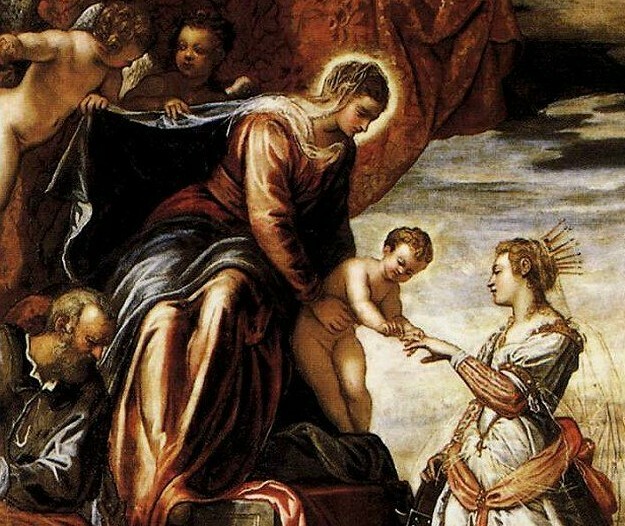 The saint was portrayed in a better known work by Tintoretto (it opens in another window), now in the Palace of the Patriarch of Venice, next to St. Mark's Basilica. 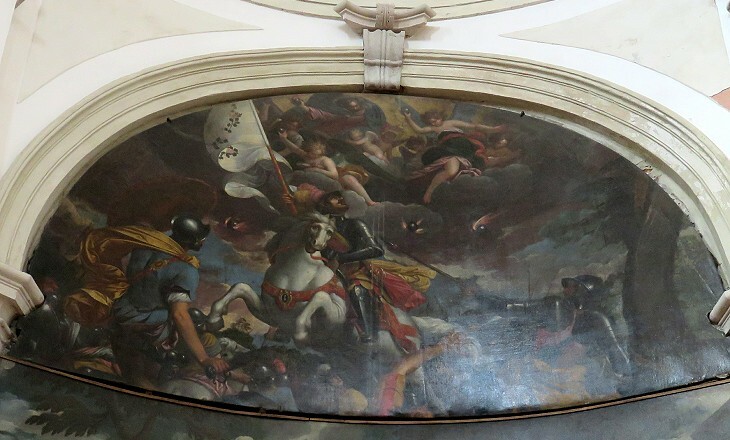 Frescoes were not suited for the decoration of churches at Chioggia (and Venice) because of damp. 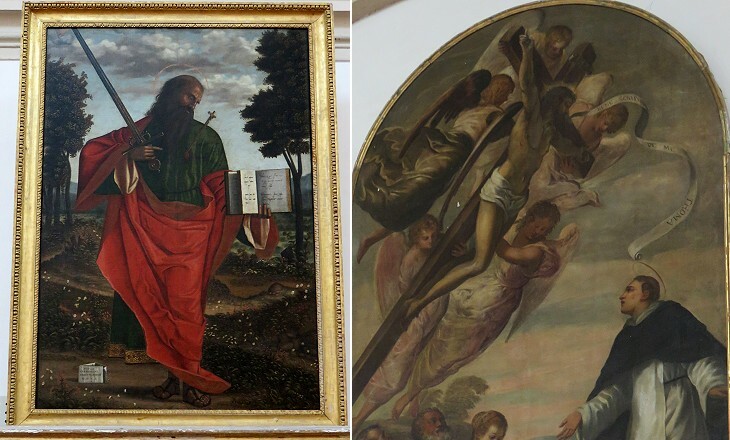 Venetian painters used instead very large canvases, known as teleri, which in some instances had a curved surface. Pietro Damini (1592-1631) lived in a period of destructive conflicts between Protestant and Catholic states (Thirty Years' War). This may explain why he was commissioned a painting on the Albigensian Crusade (1209-29), an early example of massacres motivated by different views on some aspects of the same religion. 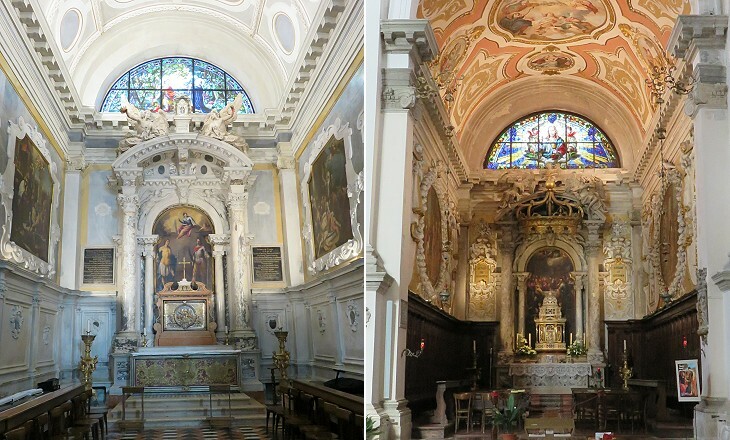 In addition to S. Domenico other churches were rebuilt or redesigned during the XVIIIth century. Depending on available financial resources their façades were entirely decorated with white stone from Istria or this was used only for a few architectural elements. S. Andrea was redesigned in 1745, SS. Trinità in 1705. 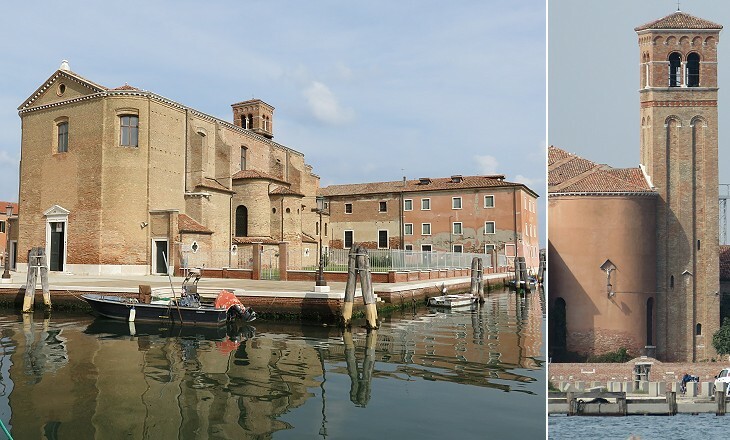 S. Francesco dentro le mura and S. Croce are other historical churches of Chioggia. A number of brotherhoods were active at Chioggia before the fall of the Republic of Venice in 1797. Their members met inside some churches (as did the Sacconi Rossi at SS. Trinità) or in small oratories. In many cases members wore a uniform and covered their head with a hood when they performed some of their tasks (e.g. burying the poor). The members of a brotherhood of Chioggia were known as the Sacconi Rossi (large red bags) because of the red colour of their uniform. The same name was used in Rome for the members of a brotherhood at Isola Tiberina who took care of burying the bodies of the drowned.